How do "illegal aliens" chart the speech sounds of colloquial English? This book is timeless in offering an unusually direct entry into how a group of Mexican fruit pickers analyze their first encounter with local American speech in a tiny rural Midwestern community in the United States. Readers see close up how intelligently migrant workers help each other use what they already know—the alphabetic principle of one letter, one sound—to teach each other, from scratch, at the very first contact, a language which none of them can speak. They see how and why the strategies adult immigrants actually use in order to cope with English in the real world seem to have little in common with those used in publicly funded bilingual and ESL classrooms. 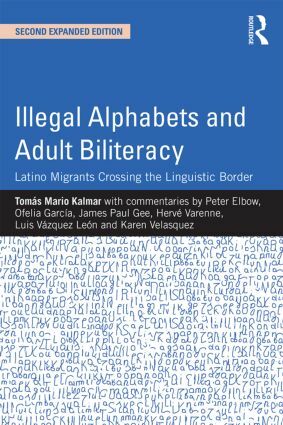 What’s new in this expanded edition of Tomás Mario Kalmar’s landmark Illegal Alphabets and Adult Biliteracy are in-depth commentaries from six distinguished scholars—Peter Elbow, Ofelia García, James Paul Gee, Hervé Varenne, Luis Vázquez León, Karen Velasquez—who bring to it their own personal, professional, and (multi)disciplinary viewpoints.